We want your first few steps with Algodoo to be as easy as possible. Therefore on this page you can find a step-by-step guide that in three sessions will make you a confident Algodoo user. In order to make this possible we need you to spend some time getting to know the software and the content that comes with it. Before starting this training make sure you have Algodoo installed and activated on your computer (more info on activating here…). When opening Algodoo for the first time you should see a welcome screen (if not the go to the top menu and click the settings button and then click “Open the welcome screen”). The aim in session 1 is to get familiarized with Algodoo. You will first learn how to create a basic Algodoo scene. When done with that you will learn more about the different tools in Algodoo. The last step in this session is how to master the magic Sketch tool. Start by running the setup guide (found in the Welcome screen) to customize Algodoo for your personal needs. More settings can be found in the Algodoo top menu under the setting button. Start the “Crash course” tutorial. 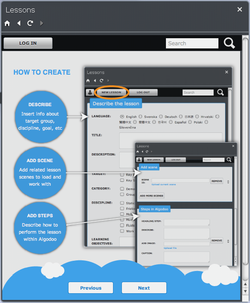 In this guide you will create your first Algodoo scene by stepping through basic features. When done with the “Crash course” step forward to the next tutorial – “Tools”. In this tutorial you will learn more about the different tools in Algodoo. Take your time to read the info text about the tools for learning more about specific settings and different tips and tricks. Start the last basic tutorial – “Sketch tool”. The sketch tool is a universal tool that lets you master most of the other tools by using different gestures that minimize the time required for swapping and changing between different tools when creating your scenes. 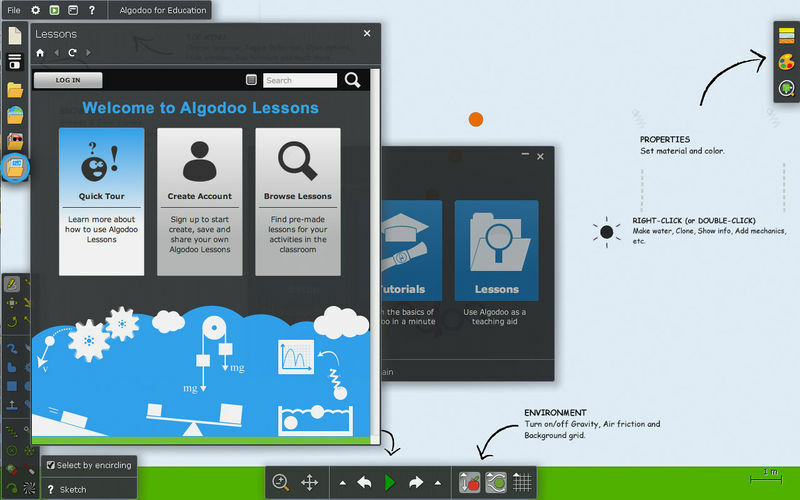 In session 2 you will learn more about how to create educational scenes with Algodoo. In our step-by-step lesson tutorials you will learn how to create your own educational scenes and what educational aspects and related questions that should be considered. The lesson tutorials require a little more of your patience and skills, yet at the same time they will encourage you to find your own ways of creating components and scenes within Algodoo. Start by opening the “Float and Sink” lesson tutorial. In this lesson you will learn how to work with water and density inside Algodoo. Take time stepping through the guide and answer the given questions. Tip: When opening a lesson tutorial. 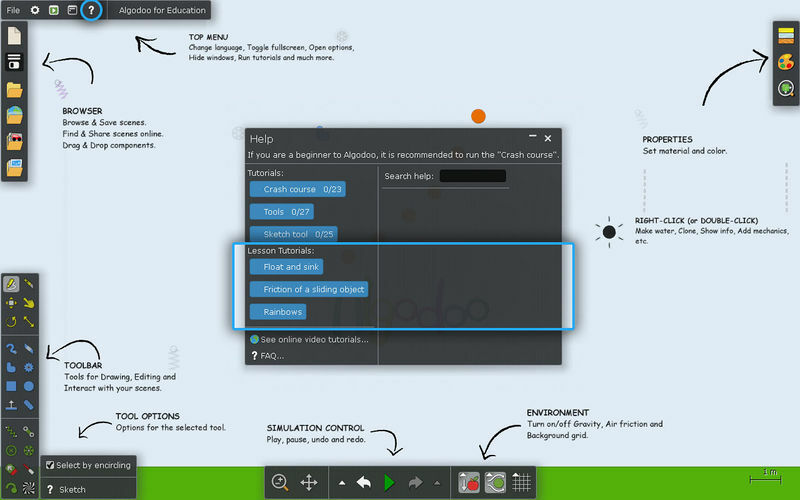 Move the tutorial window to the upper right corner in Algodoo. In this way you will be given more space for creating your scenes. Step forward to the next lesson tutorial – “Friction of a sliding object”. In this tutorial you will learn more about working with friction and different materials and how to visualize forces and velocities. Start the last lesson tutorial – “Rainbows”. This tutorial will teach you how to create and experiment with optics. In session 3 you will take a closer look at Algodoo Lessons. This is a library with more than 60+ teacher-created lessons, each and every one corresponding to different areas in the curriculum. 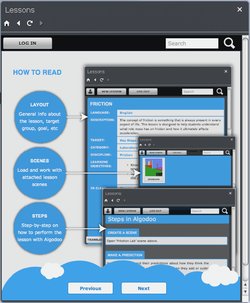 Algodoo Lessons is also designed for easily drafting, saving and sharing with other teachers or students who need content support when using Algodoo. Start by opening the lesson library. You will first enter a Welcome screen. 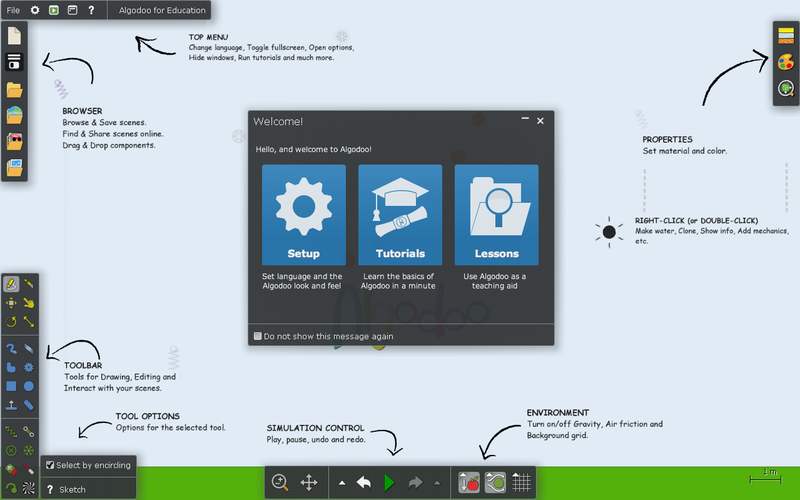 Step through the Quick tour that will guide you through basic features and the lesson layout. Create your personal account for making your own lessons. Make sure you have your license email containing your login for creating a teacher account. You can search among all Algodoo lessons using the search table or by using the search tab in the upper right corner. 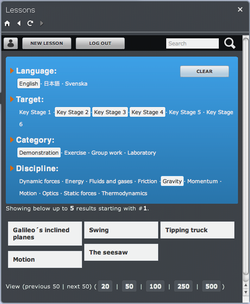 Start by entering the browsing table and look for lessons by selecting your “Language”, “Target group”, “Lesson category” and “Teaching discipline”. All lessons that match your preferences will then be listed. Try searching for lessons with the quick search. Search words: Force, friction, energy, optics, etc. Open and read your first lesson. Get familiar with the lesson layout and structure. Remember that all lessons in the lesson library are split into three different sections: 1 – General info table about the lesson, 2 – attached scenes to download and run, and 3 – a step-by step description on how to perform the lesson within Algodoo. Run a search for a specific lesson. Open a lesson from the list. Read the lesson information to get familiar with the content. Open the attached scene or follow the step-by step guide on how to design the scene. Reflect over the lesson content and design. For creating and sharing your own lessons you need a personal account (see step 2). You create a lesson by clicking the “New lesson” button and enter the necessary fields. First open/create a scene that you want to add to the lesson library. Click the “New lesson” button. Enter the general information about the lesson you want to create. Add steps on how to perform the lesson. Save lesson as a draft. You can then complete it later on. List your drafts by clicking the drafts-icon. Open your lesson again. Make some changes. If ready for publishing, click the publish button or save the lesson as a draft again. Well done! Your are now a complete Algodooer. If you like, explore more options in the lesson library, examine how to translate a lesson (there is a translate button for translating a lesson in to you language) or update your account info.